What the hell is going on in the Sunshine State? The U.S. Senate race has become engulfed in controversy as suspicions are rising concerning why two of the most liberal counties in the state have yet to count all of their ballots. Republican Gov. Rick Scott has already claimed victory over incumbent Democrat Bill Nelson. Then, Broward and Palm Beach County decided to engage in some sketchy vote tabulation methods. Counties that were hammered by Hurricane Michael have finished tallying their votes. Broward and Palm Beach are Democratic bastions that also happen to be the problem children in Florida elections. What’s taking so long? How man more ballots do they have to go? Why aren’t they giving regular updates on the vote tallies? These are questions Republicans would like to know, and something these counties should be posting on a regular basis. It’s the law. ???? BREAKING: Palm Beach County refuses to comply with court order. 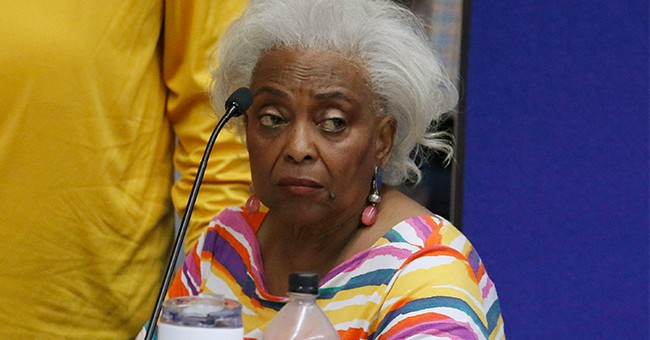 Ms. Snipes has a history of being terrible at her job. Bucher and her office are been accused of barring Scott party representatives from seeing how they draft a replacement ballot. In Florida, if a ballot is too damaged to be read by the machines, the election official can cast one replacement ballot, where these folks vote on your behalf with a newly created ballot. Witnesses need to be present. That was not the case in Palm Beach. It’s in the documents filed by Scott’s campaign for their lawsuit against the counties. Scott has vowed not to allow liberal lawyers come into the state and steal election results. Breaking from normal practice, the Palm Beach County elections supervisor banned media from filming and photographing the high-profile midterm election ballot review process amid allegations of “incompetence” by Gov. Rick Scott. Tensions flared Friday morning when Bucher threatened to have camera operators and newspaper reporters arrested for filming ballot tabulation as Palm Beach County. The meeting at least half a dozen television cameras and even more reporters as Palm Beach County is one of the last in Florida to report unofficial results in an election with three tight statewide races. Bucher accused several reporters of illegally taking pictures and videos of signatures on the envelopes of mail ballots. Reporters repeatedly assured Bucher that they were filming the board members from a safe distance as they examined ballots and decided whether to toss or count them. Signatures were not visible in any Palm Beach Post photos. Still, Bucher insisted that she’d bring officers to forcibly remove any member of the media who filmed the process.